I am writing this article so as to answer several comments and questions I have recently heard and been asked about. To be brief I am answering the people who have told me they had a hack inspector miss a trap installed backwards and asked how it should properly look. The above picture shows a proper trap with the cleanout on the bottom but I must point out that many homes do not have this feature and that is NOT a defect. Above all the water must go down to a low spot trapping anything that you may not want entering your septic system. 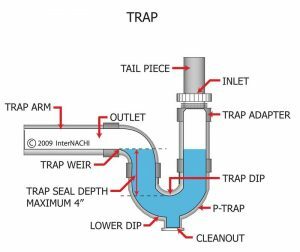 The trap adapter usually has a screw cap that tightens onto the sink drain tail piece, this piece I have often found loose and allowing a small leak. This is a defect and needs to either be tightened or have the plastic gasket replaced. If it does not have a trap cleanout, you will need to remove the entire trap which is why both ends usually have screw connectors if they do not have the cleanout. You must also check that the trap arm does NOT run uphill from the trap, this should be level. When a home inspector checks this trap, we grip the inlet and the outlet while water is draining to make sure it is secure and that there are no leaks. What First Time Home Buyers Need to Know. Here is what We offer in our Annual Log Home Inspections…. It is very important to have yearly inspections professionally performed and to keep an inspection log for your home. It is vitally important to keep a good maintenance log of your home listing all materials purchased for maintenance, any updates or improvements made to the home and all dates as well as who performed each service. These should all be kept in a loose bound binder often provided by the Builder. 1) Are there any logs contacting foliage, organic mulch, or the ground within 18 inches from the home? We look for any landscaping that may have grown up against the house or soil grade that has become too close to the sill (bottom) log. 2) We perform an adhesion test where we Press a piece of masking tape onto the log ensuring good adhesion and after pressing it on hard wait 3 minutes. Next we rip it off. If a lot of stain came off with the tape we recommend you should remove the finish before applying anything new. We try this in a few different spots as some areas wear faster than others. This takes an experienced eye to know how much is too much. 5) With a rubber mallet, we tap of the wood listening to listen to hear any hollow spots and use a moisture pin meter to check that the wood is within acceptable levels. 7) We inspect the interior with thermal imaging (IR Camera) to detect air and moisture issues. 8) Looking for signs of any insect holes, sawdust or insect debris. All log homes will have a few insect holes, but most, not all, insects are only interested in wood that has high moisture content. Many times you may find a hole where a insect who was in the tree and just wants to leave the wood for greener pastures. 10) We look for any gaps that have developed due to settling and shrinkage drying. This is a greater concern on homes that are less than five years old, but regular soil settling and erosion can occur around a home of any age. Now it is report time. Here we write up a report showing our findings and comparing the report to the previous year’s report. This should be added to you Home Maintenance log. The most common issue I find is double tapping. 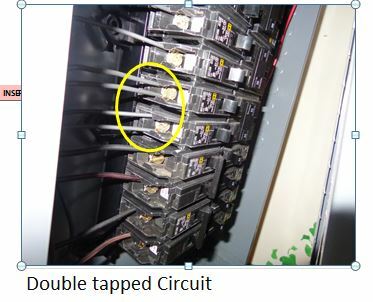 Here you see 2 wires going into a circuit breaker made to only tighten down on one wire. 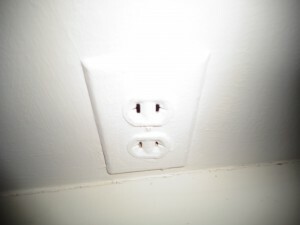 This causes a poor connection on both wires and a major hazard. Make sure you have no double tapped circuit breakers in your panel and if you do call a qualified Electrical contractor. Do you see what is wrong here? 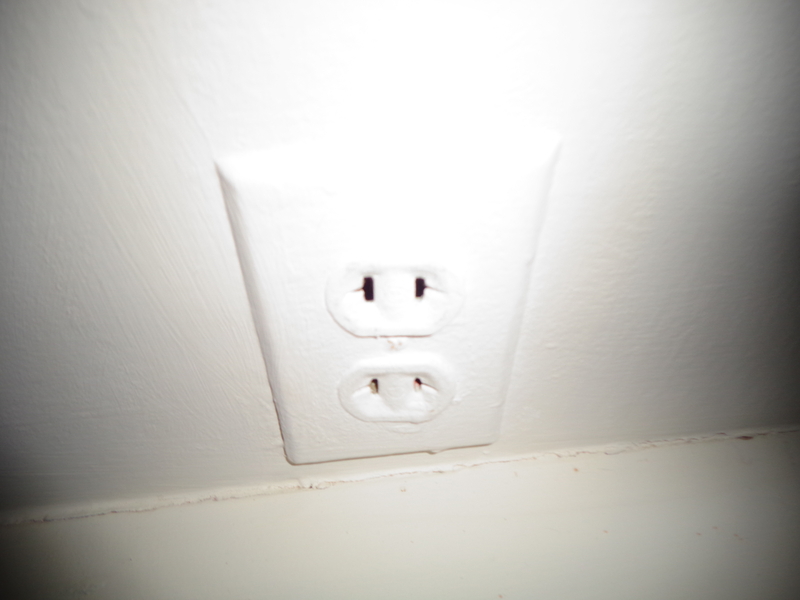 This is a common mistake mistake made by home owners which is not allowed here in Maine. 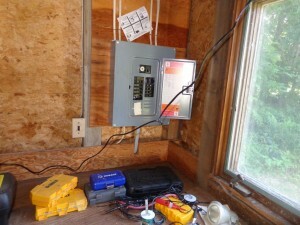 Do you see what this home owner did wrong and why The local power company will not hook him up? When I saw this I knew right away as I have seen it too many times. Many home owners live in their home day by day giving no thought to the condition of the various systems until something needs service and by that time the problem usually cost thousands more than the cost involved to prevent the problem. A perfect example comes from a recent home physical. A home owner called me in to check out his house since he was thinking of leaving it for a few months while he was going overseas and wife and children would be there alone. The first thing I noticed while doing an exterior survey of the property was how the deck was starting to pull away from the house which he had never noticed. I pointed out that this ledger board was only nailed in and should have special Ledger bolts attaching it to the house and this was an accident ready to happen. He said he would take care of this right away. I then continued to the basement where I found his chimney clean out was over full and moisture had compacted it to become quite solid which is a fire hazard. I also noticed he had installed a new hot water heater and he did not have a drip pan and the overflow elbow was missing so it was already starting to rust on top and the bottom weaken the structure of the heater and shortening the life. Next checking the waterlines I found a small leak that was up against a wall that was about to blow and become a large issue. If that wasn’t enough he had a handyman friend help wire in a few exterior outlets that were doubled tapped and Not GFCI compliant. In a total I found 23 issues that could all be corrected for a few hundred dollars but could have easily turned into thousands of dollars of repairs not to mention personal property damage or health risk. Anyways about 2 weeks later he called me. He said I was very right about the deck and he wished he had acted sooner. He had a graduation party for his daughter on the deck which collapsed and 5 of her friends were hurt as well as the deck being destroyed and a window smashed out. Luckily it was only a 5 foot drop but he was warned and could have avoided this thanks to a home physical. He told me he is now acting on the other issues, now that he understands how serious it is and booked me to come back next year. WELL DISINFECTION PROCEDURE: – Plan on it taking 24 to 48 hours for this procedure. bleach for wells over 100 feet deep. the bleach solution directly into the well. 3) Connect a water hose to the closest facet and run water through it until there is a strong odor of bleach. 4) Using the hose , flush the inside of the well casing or the interior walls of a dug well. Wash the well cap clean. Close the well cap, wait about 1 to 2 hours prior to continuing to Step 5.
the bleach from a tap, turn it off and go to the next one. If you cannot smell bleach, repeat steps 1 through 4.
more best would be overnight. 7)Flush the bleach from the well. Remember chlorine is toxic to plants and grass, so try to drain it away from your lawn or septic system. Flush the system until you can no longer smell the bleach. This usually takes up to 4 hours. If your well might be pumped dry by doing this, then you should pump in stages. For example, pump for 30 to 60 minutes, wait for the well to recharge, and repeat. 8)Open all other indoor and outdoor faucets and run until they are clear of bleach (until odor is gone). alarmed if the water is discolored and has sediment. This will usually disappear in a few days. manufactured home can create an uplift force. To resist wind forces, you need two different types of tie-downs. to compensate for the uplift force. A diagonal or frame tie-down is needed to compensate for both lateral and uplift forces. • Singlewide manufactured homes require both diagonal and vertical ties. • Doublewide manufactured homes require only diagonal ties. • To determine the length, do not include the draw bar. 3,150 pounds, with a 50% overload of 4,725 pounds. 40 degrees from a vertical direction. m, but it does detract from the appearance of your house. are also secured with frame anchors. the ground with crossing steel stakes. If you will be pouring a concrete base, you can install a concrete anchor first. Whatever type of anchors you select, care fully follow the installation instructions. will do a better job of distributing the pressure of the cable. Commercial protectors will last longer, too. TIE-DOWNS WITH A ROOF RAFTER TO PREVENT DAMAGING THE ROOF. 3/8 inches for 7 x 7, or ¼ inch for “aircraft” cable, 7 x 19.
inspector or a trained installer check over your finished work. Make sure your home is level before anchoring it to the ground. should regard this number as the minimum needed for your home. building inspector to determine your soil type. If you will be attaching your tie-downs to a concrete foundation, make sure it is at least 4 inches thick. Talk to a supplier or installer for advice.Your soil type will determine the type of anchor. entire system is certified to a 4,725 pound capacity. STEP 6: Locate wires/cables Mark the location of your electric, cable, gas, water, sewer and phone lines on the ground before you install anchors. Make sure you have located everything prior to digging. sure the strap or cable does not cover a window or door. For a vertical tie-down, the anchor is installed vertically. For a frame/diagonal tie-down, the anchor can be installed to the same angle as the tie-down. This angle should be at least 40 degrees. op of the anchor and buried in the ground. of the anchor. The collar should be at least 10 inches in diameter and 18 inches deep. adjust your tie-downs to the appropriate tension. Don’t do one side of your house and then the other. In other states, tie-downs are stringently regulated and inspected. the potential cost of wind damage to a manufactured home that was not properly tied down. I have done over 1000 basic Insurance Inspections and Reconstruction Value reports for companies like Allstate, Liberty Mutual, Tower, USAA and many others. By having this experience I have an edge on knowing what your insurance company is looking for when adjusting your rates. I have also done countless reports for companies to report on progress of repairs and construction for lenders. New home buyers should use this as a guideline when looking to purchase a property to know what they will be looking at from their insurance company. When The Insurance company comes out to see your property this is usually what is included in an Exterior Report. 5. Is there any siding , roofing, window , door, chimney or chimney crown, steps, decks or porch damage. 6. Any damaged soffits, eaves, fascia or siding dry rot or paint peeling or gutters missing or pointing in the wrong direction. 9. Identify and photograph any and all attached and detached structures on the property.